Members of the American Federation of State, County and Municipal Employees (AFSCME) are drawn from a diverse range of professions and fields, including medical, sanitation, transportation, social work, clerical, and many others in the public service sector. Nothing in the union and the country’s history brought all of them together like the September 11, 2001 terrorist attacks and aftermath. On that Tuesday morning, terrorists hijacked four airliners. One flew into the North Tower of the World Trade Center in New York City and a second plane flew into the South Tower. Within two hours of impact, both buildings and the rest of the World Trade Center complex collapsed. A third plane crashed into the Pentagon. Passengers on the fourth hijacked plane fought the terrorists and thwarted it from Washington, DC to a rural Pennsylvania field where it crashed. Two thousand, nine hundred and seventy-four innocent people died in the initial attack and many others died in the years after from health complications originating that day. Nine AFSCME members were among the victims. New York Fire Department Chaplain, Reverend Mychal Judge, AFSCME Local 299 District Council 37, died while administering last rights to a mortally wounded firefighter inside one of the towers. AFSCME paramedics Ricardo Quinn and Carlos Lillo of Local 2507 DC 37, died while helping injured people in the towers. Five members of the AFSCME-affiliated Council of Service Employees Association (CSEA) Local 1000 who worked for the Department of Tax and Finance in the World Trade Center died: Yvette Anderson, Florence Cohen, Harry Goody, Marian “Marty” Hrycak, and Dorothy Temple. AFSCME member Chet Louie was at his second job in the World Trade Center and died that day as well. Others died in the years following from illnesses such as cancer likely caused by breathing in asbestos and other harmful substances while working on site. Many union members lost family members, friends, co-workers, and loved ones. Rescue efforts lasted days and the clean up and recovery took months. Every step of the way, union members were involved. People came from around the country to volunteer their skills and time. The rescuing of survivors, recovering of remains, collection of evidence, and clean up of debris required fire fighters, police, paramedics and EMTs, police communication technicians, health care workers, engineers, transportation workers, sanitation workers, clerical workers, computer technicians, construction trade workers, and more. Unions like AFSCME were vital. Council 26 members working for the Federal Aviation Administration cleared and secured the airways. Responders and survivors needed counselors and social workers to help them deal with what they experienced, and members of Council 1707 and others stepped up. AFSCME International helped as well. 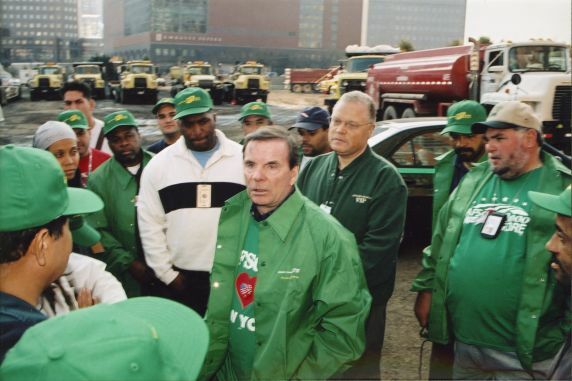 President Gerald McEntee visited Ground Zero to support members working there shortly after the attacks. The union moved its November 2001 Women’s Conference from Boston to New York in a show of solidarity with the city. The AFSCME September 11 Fund provided assistance to families of members lost and members who lost spouses during the attacks. AFSCME members from locals across the country held fundraisers and contributed their own money to support the fund. To view additional photographs from the AFSCME Communications Department Records, see the image gallery. For more on individual AFSCME member experiences, see AFSCME Publications, particularly issues of Public Employee from 2001-2002. Documentation of AFSCME’s response can be found in AFSCME Office of the President: Gerald McEntee Records. Stefanie Caloia is the archivist for the American Federation of State, County and Municipal Employees.